The 5th Generation of the Focus 14 Blue Braille Display is more rugged and stronger than ever. We’ve built the housing from aluminum and steel, added bumpers to absorb shock, and physically isolated the Braille cells to create a Braille Display to meet the demands of the active user. 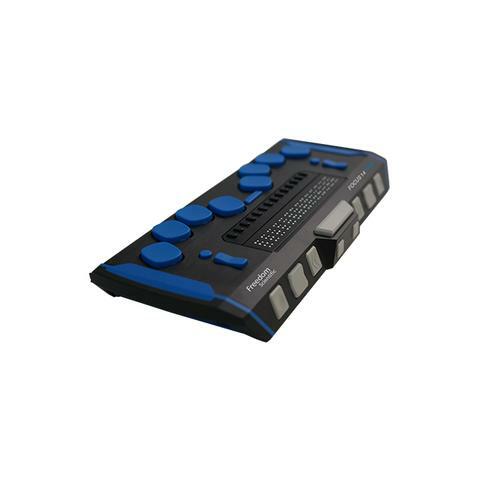 The Focus 14 Blue combines comfort, portability, and advanced features for the ultimate go-anywhere Braille interface device. A highly responsive 8-dot keyboard and seamless USB-C and Bluetooth® 4.1 connectivity make the Focus 14 Blue the ideal companion for smartphones, iPads®, tablets and other mobile devices. The new Scratchpad feature lets you take notes and read books even when you aren’t connected.